Job Shops can range from specialty construction, specialty manufacturing to maintenance overhead and overhaul (MRO). They all have one thing in common; custom work based on a customer’s needs. Clients First understands the Job Shop and needs ERP or business software to be flexible and work the way each job shop operates. The Job Shop includes Make-to-Order (MTO) and Engineer-to-Order Manufacturing (ETO) which requires meeting the diverse needs of clients quickly and efficiently, thus, demanding an equally proficient solution. In order to effectively manage these operations, ETO/MTO organizations need a production scheduling system that can manage unique job requirements, inventory control and visibility. Each product is made and engineered according to demand, making every step in the process critical for ensuring that resources are not wasted. Quoting, Estimating and even Configuration – not all job shops quote, but most do and use spreadsheets. These spreadsheets are the core of the business. Why not use a true database with job history, inventory, labor costs, customer preferences, etc,? Clients First is adept at using core ERP software to accommodate estimating, configurations, and quoting with customer history. The Job Shop that can see how much they made or profited by job, by customer is key to success. Job Shop ERP Solutions are key if implemented by an experienced team like Clients First. 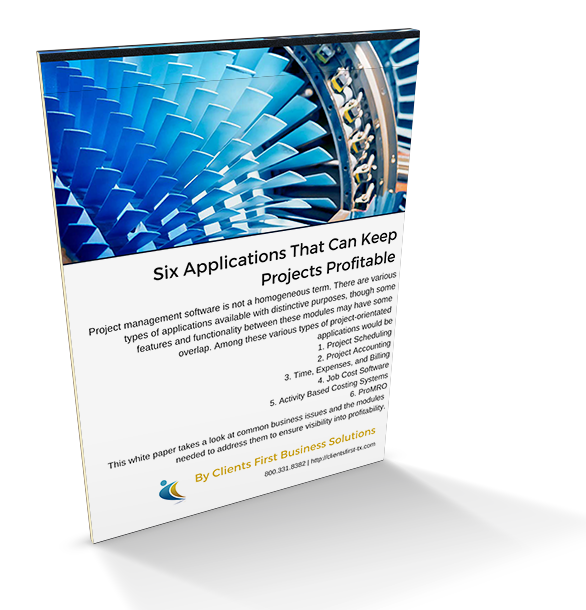 Maintaining high profit margins on projects is easier said than done. Our guide offers the necessary application requirements for Manufacturers and Industrial Job Shops to maintain profitability. Download our Guide to profitable projects now. Texas Scenic designs, manufactures and installs the theatrical stage equipment that stands behind professional performances worldwide. They provide counterweight and motorized stage rigging, lighting, dimming and control equipment, stage and acoustical curtains, orchestra pit lifts and shells and other custom stage equipment. Call us at 800-331-8382 or email us at info@clientsfirst-tx.com.